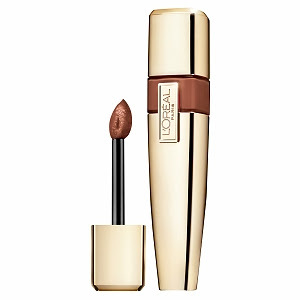 L'Oreal Colour Caresse Shine Stain bills itself as a "gloss that thinks it's a stain" and it's dead on accurate. I loved this product (my favorite day time shade was Everlasting Caramel, shown above) for when I wanted a light wash of color on my lips - with shine, that I didn't have to worry about retouching throughout the day. The color selection has many various pinks/corals, neutrals and reds. The Everlasting Caramel is my favorite for a "your lips but better" shade. The texture of the stain is very watery/oily feeling at first application, but easy to begin blending.There's no shimmer in this shade and it goes on as a slightly pink light brown. Note: the shade on the lips is NOT as deep as it appears in the tube. The finish is sheer, but can be layered slightly if you want a bit more intensity. One of the best features of the shine stain is they are very moisturizing, while maintaining the color during the day, which is something I look for in a lip stain. During an average day I saw minimal transfer after coffee/tea in the morning and lunch. I would usually only touch up 1 more time towards the end of the day to amp the shine. The packaging is very luxe for the price. The tube is very slim and chic and very easy to put in a pocket/bag on the go. There is a slight floral fragrance to the stains which I also like, and it's not overbearing. The doe tipped sponge applicator was very good for precision and applying an even layer of the color. These also work over lipstick to prolong the color of it. Some of the pinks and neutrals are fantastic over lipsticks - but note that the finish will not be as glossy, but there will be a nice color dimension and shine. They are also waterproof.